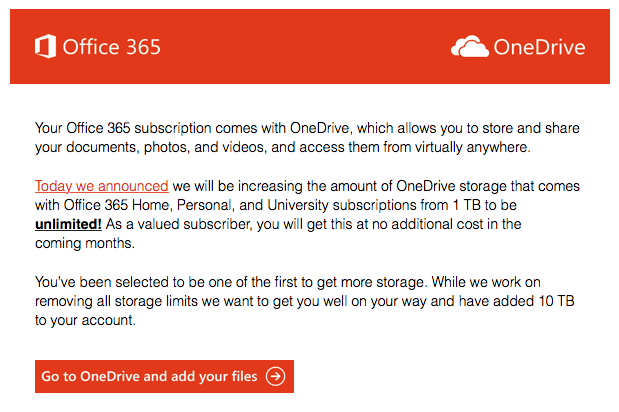 Microsoft announced today that Office 365 customers will soon have access to unlimited OneDrive storage. Yes, unlimited. With plans as low as $6.99, this might be one of the best cloud storage options you will find. In fact, one of our readers already received an email from Microsoft that said he will be one of the first and that they are adding 10TB of storage to his account as they ramp up to fully unlimited. 10TB. The goal is for Microsoft to give all Office 365 Home, Personal, and University customers unlimited storage, but it might take a couple of months to complete. If you don’t feel like waiting for a few months, you can put your name in to hopefully get on the front of the list here. In case you were wondering, Business customers will be upgraded as well, but it might take some time. To keep an eye on status, check out the Business 365 roadmap. You can read more about OneDrive’s new unlimited storage for Office 365 customers at the link below.